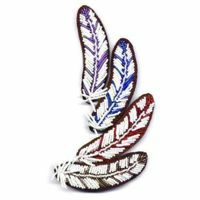 Feather/Leather : Beading Patterns and kits by Dragon!, The art of beading. The Kits by themselves do not include instructions. There are 4 different colors of Barrettes. We run out of some of the colors quite often, because the leather is hard for me to cut these days.